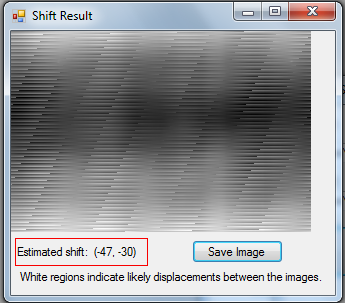 This is a small tool for estimating the amount of shift (displacement) between two images using FFT (Fast Fourier Transform). The images can be of different sizes. 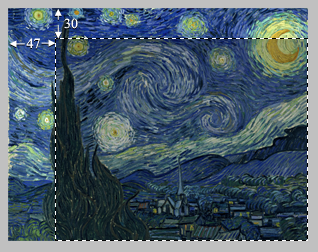 This method is faster than enumerating all the possible (x,y) shifts and selecting the right one, especially for large images. To perform the transforms it uses the fftw library. An an example of using it, consider cropping an image, so that the resulting image is 47 units across and 30 units down. 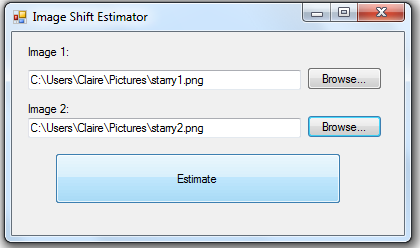 Point the program toward the two image files and hit 'Estimate'. A brute-force implementation of the same thing is very doable but takes around 30 seconds on this sample.